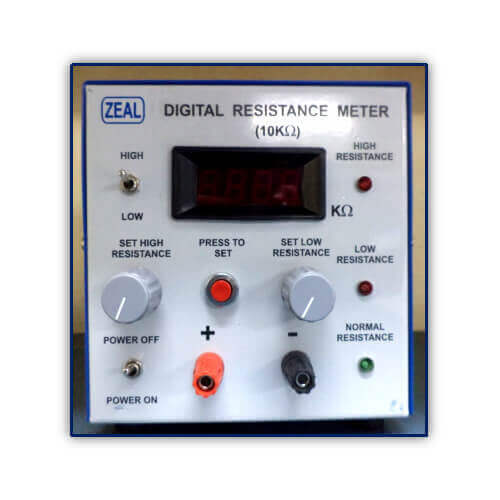 We have carved a niche amongst the most dominant names in this domain, involved in manufacturing and exporting a superior quality range of Digital Resistance Meter. The communications industry is continually evolving, producing and demanding smaller products with advanced technologies. We deliver quality products, such as the digital resistance meter, which meet the needs for supporting smaller and more precise products. Through innovation and production, we provide business tools to meet the challenges of a dynamic market and such production standards as criteria. Indication LED indicator for Low, high and normal (within specification) resistance value. Settings knobs shall be provided to set acceptable Low and High value of resistance. Potential free contact will be operated when i/p resistance value is not within acceptable Low or High (out of specification).